iSectors’ comprehensive ebook is your guide to uncovering the power of liquid alternative investments and the new opportunities you can provide for your client portfolios with iSectors Liquid Alternative ETFs—the Future of Investing. Our innovative ETF portfolio allocation models provide new and better strategies with which to invest in today’s financial markets. iSectors objectives are simple: improve risk-adjusted portfolio performance, increase diversification, liquidity, and transparency and reduce costs. 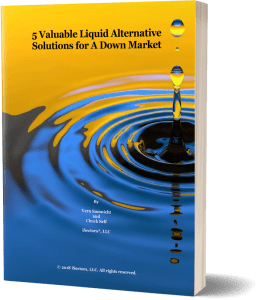 Please sign in or register to read our the 30 page eBook, 5 VALUABLE LIQUID ALTERNATIVE SOLUTIONS FOR A DOWN MARKET.